Bali cattle are named after the island of Bali which is part of Indonesia. It is believed that they are the tame/domesticated version of the wild Banteng. • Bali cattle are reported by four countries: Australia, Indonesia, Malaysia, Philippines. • Indonesia has the highest population. • Bali cattle are no longer listed for Cambodia, Lao PDR, Thailand and Viet Nam. • Cambodia and Lao PDR both list the Tsine; Thailand lists both the Tsine and the Banteng. • The transboundary/brand-name is Bali. • Herdbooks exist in Indonesia and Malaysia. • Their primary use is for meat. • They have a high heat tolerance. • They cope well on poor pasture or fodder. • The breed is very fertile (possible due to the long period of bring in heat). • They have a high degree of disease resistance, except for MCF (Malignant Catarrhal Fever - carried by sheep) and Jembrana disease (an acute viral disease carried by cattle). • A lot of crossbreeding with zebus has happened (see Rambon as an example). • The Cobourg Peninsula population in Australia has supposedly been feral since 1850. • Pied and white animals can also be found. There is even a sacred white herd still being kept at Taro Kaja traditional village on Bali. • They are also used for tillage in paddy fields and pulling light carts (but their hooves are not hard enough for heavy road work). • Enormous wooden bells (with long, tubular wooden clappers) called ‘Groemboengan’ are used in rice paddy plowing competitions. They are placed around the necks of oxen teams to give sound while they are walking. Even and rhythmic bell-sounds win the race, not speed. Smaller versions of these wooden bells can be seen around the necks of Bali cattle on the internet. Bali cattle belong to the Bibovine cattle group. 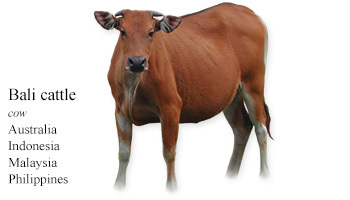 Bibovine refers to several species of large Southeast Asian wild cattle that are closely related to common cattle. My Daily Cow® Australia, Indonesia, Malaysia and the Philippines and read about other Australian, Indonesian, Malaysian and Philippine cattle breeds.